Welcome to the Mid-State DeLorean Club! We're an informal group of DeLorean owners who have come together to share our interest in the DeLorean Sports Car. 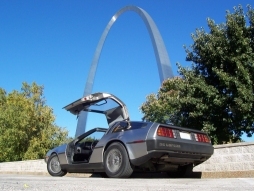 Our group is currently centered in the South-Central Illinois / St. Louis Metro area where we got our start, but it's open to anyone with an interest in DeLoreans. We currently have members located throughout Illinois, Iowa, Indiana, Missouri, Kentucky, Ohio, Colorado, and Utah as well as other areas of the US and Canada. Our present membership includes a wide range of enthusiasts who possess a vast array of knowledge and expertise about the DeLorean automobile. Our goal is to assist other DeLorean enthusiasts through the exchange of this information. Our philosophy is to have fun and enjoy the DeLorean automobile. We encourage participation in events which involve using and enjoying these cars. The club is very informal, with no dues charged for membership. Everything we do is on a volunteer basis. We do not have elected club officials, although the three people listed in the club contacts section are presently taking the responsibility for coordinating events and distributing information to the members. As with all clubs, any members who want to help are encouraged to participate and are more then welcome to join in. The only thing we request from the membership is participation, although it is left up to each member to decide to what extent they want to do so. If you are interested in finding out more about our group, please get in touch with one of the people listed in the Contacts area.